Guests can enjoy SummerFest at Gaylord Palms Resort now through Aug. 13. The spirit of summer, the beach, and the waves are alive at Gaylord Palms Resort this summer with the return of SummerFest featuring Surf In & Rock Out. 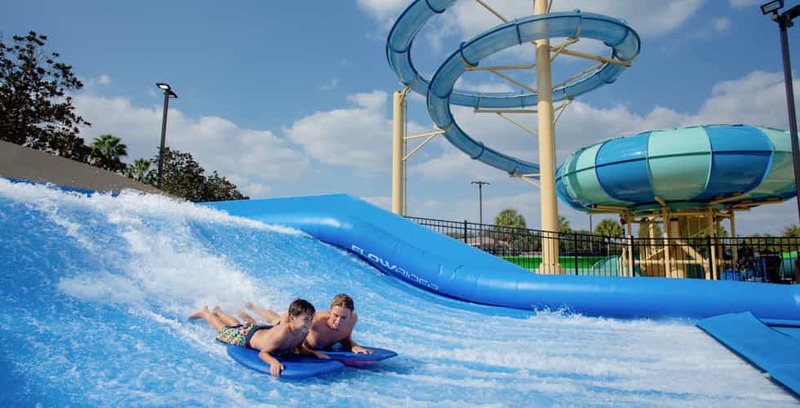 This event is offered now through Aug. 13, and the family-friendly event will give guests a chance to sing along with their activities and shows, as well as a shot at riding the waves on the resort’s FlowRider Double and sliding down one of seven waterslides at the expanded waterpark. Aquafina RiffTide Pool Party – Guests can join in on jam sessions with DJ Cowabunga Chris as he spins classic and modern tunes while hanging out in Cypress Springs Water Park. Summer Fun at Relâche Spa – Indulge in some rest and relaxation with a Rock of Anti-Aging Treatment, or create a fragrant scrub, lotion or fizz with special treatments and services. I Wanna Rock! Sing-A-Long Show – Guests can let loose and show off their inner rock star with Gaylord Palms’ own Pop Princess and Rock Super Star, as they dance, sing and play along to their favorite pop and rock hits on the Cypress Spring Stage. Rockin’ Arts & Crafts – Younger guests can be creative with arts and crafts outside on the pool deck. PJ Party Under the Sea – On Friday and Saturday nights, guests can join in on the pajama party fun with a night of games, a dance party, bedtime stories and snacks. Cypress Springs Theater Showings – Each day, guests can start their morning with cartoons on the giant Cypress Springs pool movie screen, and end their days with a dive-in family movie by the pool. Build-A-Bear Workshop on the Pool Deck – On select days and weekends, guests can create new fluffy friends with the poolside Build-A-Bear Workshop. Paint the Waves Party featuring the GlowRider – On select Friday nights, guests can experience the FlowRider in a whole new way as it becomes the GlowRider. DJ Cowabunga Chris will spin tunes the entire night as the Cypress Springs pool turns into a colorful, vibrant playground. Rock n’ Roll Never Dies Ghost Tour – Friday and Saturday nights turn the Gaylord Palms ghostly with a guided tour through the atrium, as guests listen to tales of the most haunted places in Florida, and a ghost story about a rock legend who wasn’t ready to let the music die, even after his own death. In addition to all of the summer activities that SummerFest has to offer, guests can enjoy face painting, rocker hair braids, airbrush tattoos, poolside games and more. Gaylord Palms is offering a special SummerFest featuring Surf in & Rock Out Package, available all summer long starting at just $179 per night, plus taxes and fees. The package includes a welcome bag, $25 resort credit per night, two drink tumblers with unlimited soda refills, and a SummerFest lanyard for each guest.